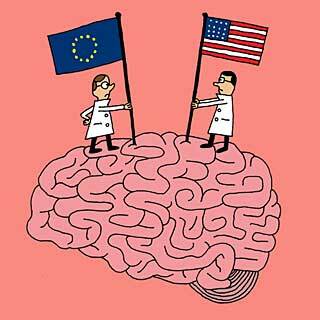 Several weeks after the public announcement of the Human Brain Project as a european research FET Flagship by the European Commission, the US administration unveiled the planning of a decade-long scientific effort to examine the workings of the human brain and build a comprehensive map of its activity, seeking to do for the brain what the Human Genome Project did for genetics. The project called Brain Activity Map (BAM) will include federal agencies, private foundations and teams of neuroscientists and nanoscientists in a concerted effort to advance the knowledge of the brain’s billions of neurons and gain greater insights into perception, actions and, ultimately, consciousness. Moreover, the project holds the potential of paving the way for advances in artificial intelligence. The Human Brain Activity Map initiative will be organized by the Office of Science and Technology Policy (OSTP). Partners will be the National Institutes of Health (NIH), the Defense Advanced Research Projects Agency (DARPA), the National Science Foundation (NSF), the Howard Hughes Medical Institute (HHMI) in Chevy Chase, the Allen Institute for Brain Science in Seattle and other big actors as Google and Microsoft. Decipher the basic language of the brain : What is the basic element of neural computation ? What is the basic scheme by which symbolic information (like sentences) are stored ? This entry was posted in Science & Philosophy and tagged brain, intelligence by Marco Barnig. Bookmark the permalink.